What is Open Signal you may be asking yourself? Well, have you ever wanted to learn how to use the audio and video equipment to film a movie, or do you have a good idea for content for the public access channels or maybe have you wanted to get to know some of the artists in town and learn about their artistic process? Open Signal offers opportunities for all of these and much more. 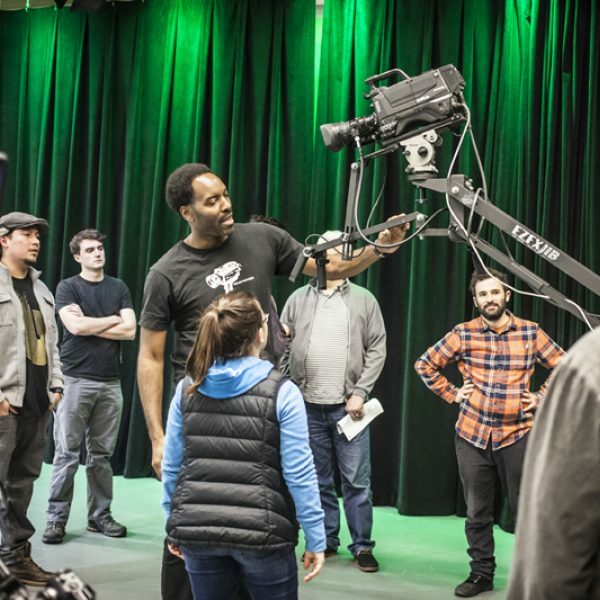 Originally called Portland Community Access and focusing on providing content for the public access channels for the last 35 years, the media arts center is now making media production accessible for anyone and everyone in Portland. Rebecca Burrell, the Director of Strategy and Development, led our tour of the renovated facility and shared Open Signal’s vision for the future of the space and the educational opportunities they offer. Launching in 2017, Open Signal builds on this 35 year legacy of Portland Community Media Center to create something unique to Portland and also the Pacific Northwest. Offering a co-working space, artist residencies, workshops, classes, studios, and space for residents to just come and hang out or get access to computers and internet, there is something for almost everyone. “We are building Portland’s first full-scale media arts center,” says Justin Harn, Open Signal Executive Director. Harn was hired in January 2016. He was previously the executive director of the Hollywood Theatre and when he came to Open Signal he brought some staff from the theater and all of the curriculum. The classes cap at 12 students which allows for lots of contact with the instructor. The media classes teach students to use software and equipment, let you experiment with technology and certify you to use their equipment library and production studios, which happens to be one of the biggest studios in the city. The classes are offered to kids ages 8 – 18 and to adults as well. Also offered are summer camps, artist talks, and a wide variety of workshops. Once certified you can check out some of the almost $650,000 worth of state of the art equipment that Open Signal has in its inventory. In addition to the classes that are offered onsite at Open Signal, they also partner with local K-12 schools including Open School North, an alternative middle school in North Portland, facilitating a curriculum integrated media program. Another great opportunity is Stream PDX, the podcast and storytelling studio led by Tyesha Snow which is located in a trailer in Open Signal’s parking lot where you can purchase a membership and then record your own podcast. We are hoping to start our own neighborhood podcast if anyone is interested in getting on board for this thrilling adventure. Starting in the fall of 2017 Open Signal’s televised content will become available online which will increase access and viewership accommodating those who get their media via the internet rather than by traditional television. Want to learn more or see the facility and equipment for yourself? Feel free to stop by or make sure to come to the next Open House on May 6 from 4-10pm. You can tour the facility and see the equipment, attend a workshop, record a podcast, register for classes, enjoy some refreshments and tell staff how Open Signal can best serve the community. Burell says, “We are excited about how arts can help build community and inspire conversations.” So come help form some new neighborhood connections, discover your creativity, and maybe record an interview in our podcast to be shared with our city and Eliot residents for generations to come.